First of all, I would like to wish you all a HAPPY EASTER! It was Good Friday and I decided to make these bunnies from a Honey Bunny Bun recipe I saw on Pinterest. With a little help from both mum and little sis, this is what I achieved. I like to bake because I feel like my efforts are being rewarded greater than cooking normal meals. For example, you might spend an hour on a main meal and then it gets eaten in 15 mins. However, if I bake, the produce will last for at least a few days. Somehow this makes me feel better. Am I weird? I don’t bake that often nor am I awesome at it. I have never baked bread before other than a few pizza bases. I didn’t do a lot of things differently to the recipe though I did find a few things weird. First, I didn’t expect the amount of yeast required – 2 table spoons. In the end, I decided to put in the whole 2 table spoons. My mum also thought that it was weird to mix in the oil, sugar, water AND yeast in one go. Though I already did that before she saw and it turned out okay. I found out only after all the ingredients were mixed that we don’t have a bread dough mixer (the spiral kind, not the cupcake kind). Luckily, mum owns a Thermomix – a neat little kitchen gadget, practically good for anything from making juices, mixing stuff, making soup to even cooking rice, pretty cool huh. So that’s one thing I did differently. Second thing, mum couldn’t remember where she’d put the honey so we ended up glazing it with golden syrup instead. Thirdly, I am not very artistic – I tried poking it with chopsticks to create eyes but they ended up looking a little creepy and thought that it would look better without the eyes. So in the end we ended up with 24 faceless bunny buns. Fourth, I used a fan forced oven so I lowered the heat by 20 degrees Celsius from the recommended temperature and the bread were cooked in less than 10 minutes (a few minutes less than the recommended 11-13 minutes). The recipe is American so it uses Fahrenheit instead. I simply used the Google converter to convert to Celsius- easy peasy. A Tip: You know bread is ready when it sounds hollow as you tap the bottom of the bread with your nail. Be careful though! It’s HOT! FRESH – fresh out of the oven, they taste like heaven. Slightly crunchy on the outside, but still very fluffy on the inside. The taste is similar to that white table bread at fancy restaurants. I was worried that the golden syrup might taste a little weird and yeah honey would have tasted better but this was fine too. A light brush at the top of the bunnies gave them a slight sweet taste but nothing overpowering. Needless to say, I was quite proud of it (being my first bread and all). NEXT DAY – I was a little disappointed when I picked a bunny up. All the golden syrup have been absorbed and the outside was not crunchy anymore. The inside was less fluffy too. But I guess this was to be expected from a day-old bread. I wonder if I put it in the oven again for a few minutes it would be a little crispy again on the outside? Maybe I should try. VERDICT – So I like to categorise recipes into 2 piles – worth doing again and not doing again. I also like to put some notes on them so I remember what went wrong last time or what could be improved. This recipe is definitely going into the worth doing again. Not only is it cute, but it’s also very Though next time I’d probably bake this in the morning and maybe just make half the recipe or something (my family doesn’t eat a lot of bread). Also maybe I will get mum to make some soup to go with it. Hmmmm…. So that was my experience with this recipe. Do let me know if you like these kinds of posts where I try out recipes. Of course the taste comments will only be based on my opinion and whoever is around me at the time. Thank you for taking the time to visit my blog and read this post! I know, I can’t believe what I saw either. I’m not normally a candle-burner and I am sensitive and particular to smells. (I am one of those people who can smell cucumber, celery, rain, coriander, etc) I absolutely do not enjoy sweet milky smells unless it’s a real cupcake or cookie baking. I have tried a couple of the Glade candles (the Lavender and the colour-changing candle) a while ago and I love them but most of the time I hesitate buying candles just because I don’t think they’re worth the price. I went to K-Mart (Australia) the other day and found these little candles for $1 each! I know, out of all places to find candles. But hey, Australia don’t have Bed Bath and Beyond and so the ever so popular Slatkin & Co. and Yankee candles are almost impossible to find (unless if I buy them online). I was of course sceptical as to how these candles smell, but at the same time I couldn’t resist smelling all the scents they had. 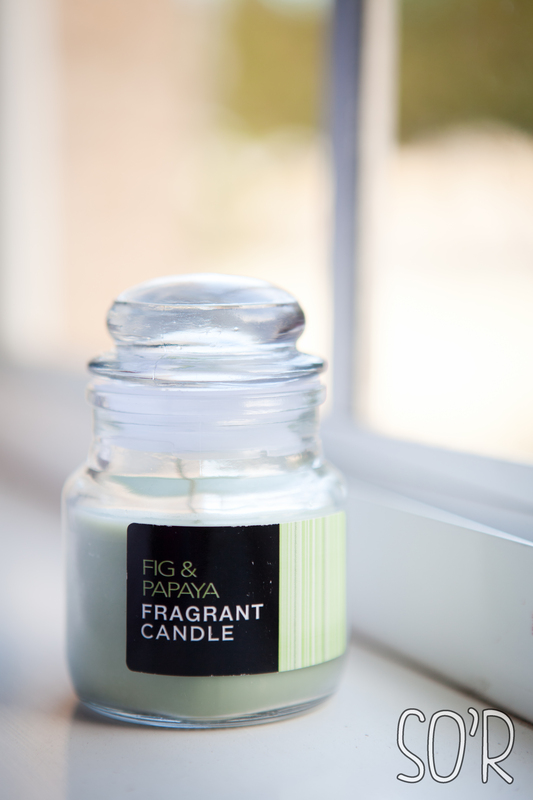 The candle that I picked up was the first candle I smelt and oh my, it smells fresh and fruity and delicious. Then I thought I should smell the other ones too – bad choice. They all smelt horrible to me and I hated them. In the end what made me buy this candle was the price. For $1, even if it doesn’t make my room smell nice, at least I will have a candle for possible future photography projects. The candle is burning on my desk right now and it has been for the past maybe 20 minutes and yeah I do smell it from here. So I guess the $1 was definitely worth it. Anyway, do check these candles out. TIP: I heard that the correct way to smell candles at the store is to smell the lid. That way, all the scents are already “mushed” together and you’re not just smelling one element of the candle. Let me know if you like these kinds of posts so I can do more!